Are interfaces between your LIS and referring physicians EHRs causing you headaches? On one hand you don’t want to lose business to the “Super Labs”, but on the other hand interfaces are time consuming and costly to implement. Relying on your LIS or other vendors to build interfaces is a slow and arduous process. Not to worry, eTransX can level the playing field with the “Super Labs” when it comes to interfacing capabilities. With eTX HEMI and eTX Stream you can bring the application integration process in-house, giving you greater control and substantially lowering your costs. When it comes to application integration, hospitals face some of the most daunting challenges. You not only have to integrate the numerous software systems within the four walls of the hospital, but you also need to interface with the EHRs of referring physicians, laboratories and specialty practices. Given the vast and ever growing selection of EHRs on the market, implementing these interfaces can be a very challenging and costly task. This is where eTransX can help. Our HL7 Integration Engine, eTX HEMI, can dramatically reduce the cost and complexity of developing, testing, deploying and monitoring both your internal and external HL7 interfaces. As with many small hospitals, critical access hospitals are in a difficult position. The are stuck between the need for more advanced information technology and the limited resources, in terms of both people and money, to make it happen. Fortunately, HEMI is well suited for hospitals with these limitations. With HEMI, critical access hospitals, or really small hospitals in general, gain an enterprise class HL7 integration engine at a reasonable cost and are supported by a team on integration experts that can offer a complete outsourced solution. For healthcare software vendors, such as EHRs, practice management, patient portals, and more, the ability to quickly and efficiently integration with external applications is critical to your ultimate success. While you could look to develop a simple integration engine in-house or use an open-source solution, often times this leads to capability limitations or consumes much needed internal resources. eTransX offers powerful integration solutions and a team of integration experts to enhance the solutions offered by HIT software vendors. 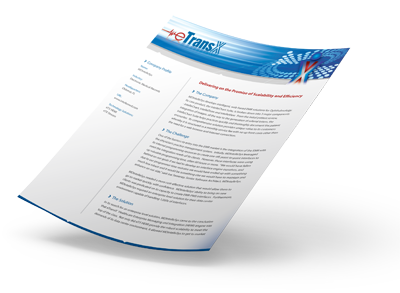 eTransX offer a broad range of integration, care coordination and population health solutions for ACOs and Clinically Integrated Networks at all points along the HIT evolution process. eTransX provides an affordable, easy-to-use and scalable solution for collaborative care for even the most challenging/complex environments. HEMI, our high performance integration engine, allows ACOs/CINs to overcome the information silos by dramatically reducing the cost and complexity of building, testing, deploying and monitoring HL7 interfaces. This functionality can easily be expanded to offer full HIE functionality or comprehensive care coordination and population health capabilities.